Back in the sixties, the main activity of IFORS was the organization of triennial international conferences addressing the world community of operational researchers. At that time, there was in Europe an increasing awareness of numerous ongoing OR activities on one side and, on the other, rather weak means for promoting communication and cooperation among European operational researchers. Some national societies did (and do still) cooperate on an ad hoc basis but not to an extent to satisfy the general need for 'something' between IFORS and the national societies. In conjunction with the 6th IFORS-Conference (Dublin, 1972), the participating presidents of European OR societies discussed the situation and agreed to seek it improved. Invited by H.-J. Zimmermann, President of the German OR Society, representatives of eleven European OR societies met in Düsseldorf on 3 September 1973 and agreed that European national societies would be contacted for their views on various potential initiatives, including setting up a European coordinating body . The representatives agreed that it would be advisable to formalize and institutionalize increased European cooperation. To this end a possible agreement between the European OR societies was drafted and it was the general consensus that such an agreement could be signed by the societies in the near future. It was furthermore agreed to assemble operational researchers from all Western European countries within the framework of the First European Conference on Operational Research. The Belgian OR Society accepted the invitation to host this meeting and the OR societies of Denmark, Germany, United Kingdom, Norway, The Netherlands and Sweden agreed to finance the preparation by offering loans as a supplement to funds already raised for that purpose by the Belgian Society. IFORS also offered to provide a loan if necessary. The meeting was scheduled for January 1975 in Brussels, Belgium. Normally 9 months would have been totally insufficient to prepare for an international conference addressing the entire OR community in Europe. The enthusiasm and involvement of all those who participated in the preparatory work compensated for lack of time. 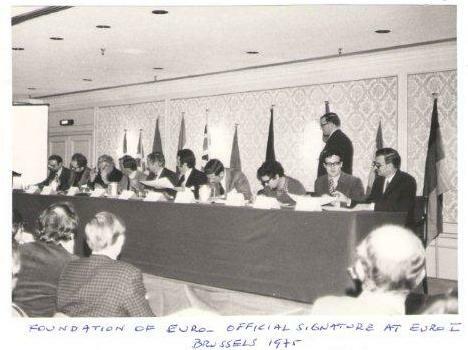 Thus the First European Conference on Operational Research (EURO I), was opened on the morning of 27 January 1975 at the Sheraton Hotel in Brussels. The meeting which managed to assemble no less than 506 participants was a remarkable success. To grant to any fully paid-up member of any signatory body all rights and privileges which were offered by them to their own members. To exchange all appropriate information, inform other signatories of existing working groups and the dates and locations of the meetings and open such working groups to individual members of other signatories. To organize European Conferences on Operational Research and European Working Groups. To encourage the formation of Operational Research Societies in other European countries and to give such new bodies any possible help they might require. On 8 March 1976, in a circular letter to all European OR societies, the Honourary Secretary could proudly announced: 'I hereby declare that EURO, The Association of European Operational Research Societies within IFORS, is now formally constituted with effect from 5 March 1976 and the draft statutes circulated on 29 June 1975 are effective' . By 18th June 1976 ‘the definitive statutes and by-laws of EURO were ratified in total by the OR societies of: Belgium, Denmark, Finland, France, Germany, Greece, Ireland, Italy, The Netherlands, Spain, Switzerland and the United Kingdom’ . Following the success of EURO I a second conference was held in Stockholm in 1976. In 1977, EURO co-sponsored the TIMS (Institute of Management Science) XIII international meeting, held in Athens, Greece. The IFORS triennial conference was held in 1978 and thereafter EURO-k conferences have been arranged for the interim two years between IFORS conferences. The membership of EURO increased as more national societies joined IFORS and consideration was given to countries outside of the European Union. 'For instance, in November 1987 the Executive Committee received a letter from the President of the Operations Research Society of South Africa requesting membership of EURO. There is no African regional grouping of IFORS and the case was made that collaborative links already existed with some individuals in EURO and there was better access in terms of transport to European countries.'. 'Eight working groups were established at the first EURO conference in Brussels in January 1975: O.R. and Energy Problems; O.R. Applied to Health Services; Fuzzy Sets; O.R. in Government and the Public Sector; Multicriteria Decisions; O.R. in Banking; O.R. in Regional and Urban Planning; Education.'. ‘In the early years of EURO Germain Kreweras and Jakob Krarup edited a charter providing a structure to the Working Groups within a EURO framework.’ . The idea of starting a European journal was raised in the first meeting in Amsterdam in 1974 and received ‘considerable support’ . In January 1975, a committee was formed to investigate the feasibility of launching a journal dedicated to OR across Europe. The first volume of the European Journal of Operational Research (EJOR) was published in 1977, in time for the second EURO conference. ‘EJOR became a EURO journal in 1990 and since then has continuously grown in terms of reputation and quality (through measures such as the impact factor) to be one of leading journals of the international OR community’ . 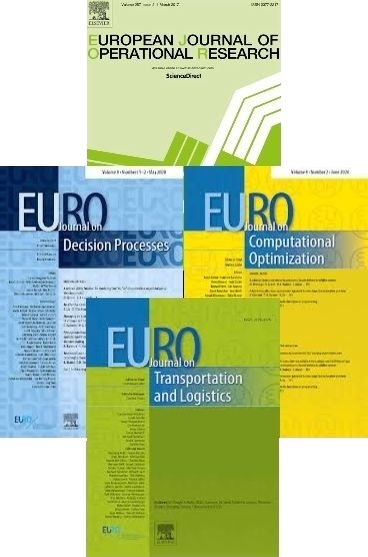 In 2010 EURO agreed to investigate the option of diversifying its portfolio of journals, and in 2011 three new journals were officially launched: EURO Journal on Transportation and Logistics; EURO Journal on Computational Optimization; and EURO Journal on Decision processes . In July 2012, EURO agreed to set up a series of advanced tutorials to be a useful resource on particular topic areas within operational research, and which would benefit new research students or individuals who wish to find out more about a particular specialism . Considerable progress has been made over the years since EURO was established, including the further development of existing instruments and the establishment of new ones. In 1983 three additional instruments were proposed and ‘enthusiastically approved by our EURO council’ . The EURO Gold Medal was awarded for the first time to Hans-Jürgen Zimmermann at EURO VII in 1985. EURO Mini Conferences were initiated in 1984 to offer a more focused event for specialized themes and with more limited participation. The first EURO Summer Institute was held in 1984 on Location Theory; it was hugely successful and led onto further collaboration after the event . The EURO General Support Fund was set up in 1994 as a way of encouraging and funding other appropriate activities. In 2001 ORP3 was introduced as a forum promoting scientific and social exchanges between the members of the future generation of Operational Research in academic research. Additional prizes and awards have been approved: EURO presents a Distinguished Service Medal Award in recognition of service to EURO and to the profession of operational Research; submissions are invited for the EURO Doctoral Dissertation Award and EURO Excellence in Practice Award; the most recent annual EURO awards are for the best papers published by EJOR. Further initiatives have been introduced to promote OR education such as the EURO PhD Schools. Further information can be found on the current webpages. Zimmermann, H. -J. The Founding of EURO The Association of European Operational Research Societies within IFORS. 1995, European Journal of Operational Research 87, pp. 404-407. Rand, G. K. Forty Years of IFORS. 2001, International Transactions in Operational Research 8, pp. 611-633. Brans, J. P. EURO Bulletin 6. 1977, European Journal of Operational Research 1, pp. 69-71. Speranza, M. G. Association of European Operational Research Societies. 2012, Wiley Encyclopedia of Operations Research and Management Science. Brans, J. P. EURO 1975-1995: A fruitful evolution. 1995, European Journal of Operational Research 87, pp. 408-414. Eddison, R. T. Notes of the Meeting of the European Committee Amsterdam 3-4 May. s.l. : (confidential to the EURO Executive Committee), 1974. Speranza, M. G. EURO announces three new journals. IFORS News. September 2011, p. 28. Brans, J. P. Editorial. 1985, European Journal of Operational Research 20, pp. 294-297.